My husband and I attended a sweet 16 birthday party in this holiday season. 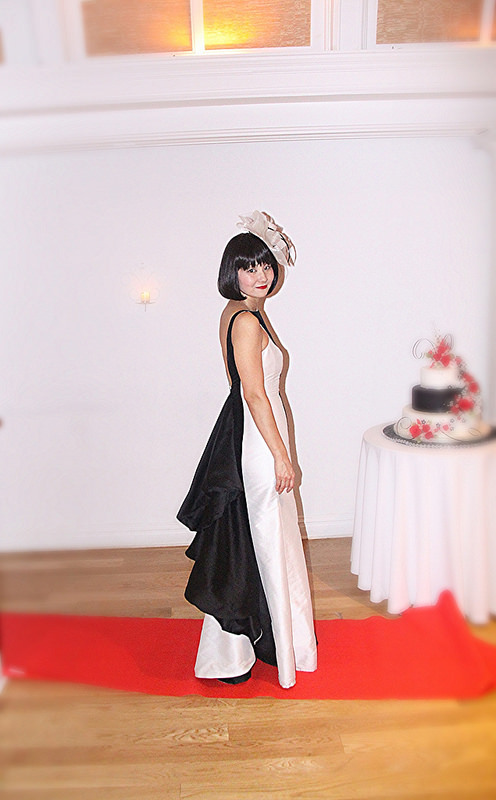 It was a formal black-tie dress code affair in theme of white and black. It was my very first time attending a sweet 16 birthday party. The birthday girl came out in a beautiful long red dress. I did not have a long formal dress in black or white and I had about 3 weeks to think about my dress. I also knew that I had to consider my breast condition while choosing a dress. Toward my reconstruction surgery in January, my plastic surgeon would inflate my left breast larger to stretch my tissue over that three weeks. I knew that my breasts would be asymmetric by the event day. I could not choose strapless nor low-cut dresses. After browsing many websites and stopping and trying at different shops, I decided to rent from Rent The Runway website for 4 days. It was perfect for me. Black and white are challenging to me as I usually choose some colors in clothing. How can I find a dress that shows me in the basic colors while all other guests are also in the same colors? When a dress is impressive, then I don’t want to wear it too many times. People may remember me wearing it over and over again. White color may turn into yellowish after awhile in my closet, if I buy one. I barely have chance to wear long dresses. So, renting one is a great idea. It has so many choices and options. It comes with the identical additional dress in one larger or smaller size for just in case of its fit, if available. I was very excited when one of the dresses fit me perfectly. The length was almost made for me. A beautiful dress. It also comes with pre-paid package to ship the dress back to them. It was very easy. I received the invitation 2 weeks after my last chemotherapy. I still felt tired and nauseous. But finally, it gave me an opportunity to look forward to something for 3 weeks. I had spent the last 7 months, only tried to look at a day by day. Everything was new to me and I have been learning along with my surgeries and treatments. During chemotherapy, thinking of future is especially scary and daunting. Knowing that every three weeks, I would feel sick and tired for weeks, are not something that people look forward to. Thinking of future was overwhelming. So, it was perfect for me at the perfect timing. Although, at one point, I started to feel that panicky feeling was coming back to me at the party. I managed handling it by deep breathing or Mindfulness practice. Over all, I felt very living at the party. I could not walk up-hill by myself nor wear high heels a month ago. I was dancing with high heels. I could not taste food, food looked gray to me, now I was enjoying the food. It was very thankful. I hope to come back to this blog entry to look back from time to time after years from now. I would like to make sure to appreciate of life. Yoko you look stunning…so glad to see you out and about and feeling good!!! Thank you! I took a chance that the dress would arrive a day before the event, LOL. I was not 100% sure about how it would look on me, but I pulled it off pretty well. Not just such a gorgeous dress and stylish look, but your mindfulness practice!!!!!! I am super happy to hear that the panicky feeling did not spoil your special night! As I said, you’re such a excellent, open-minded student! BTW, Thanks for the great time the other day!